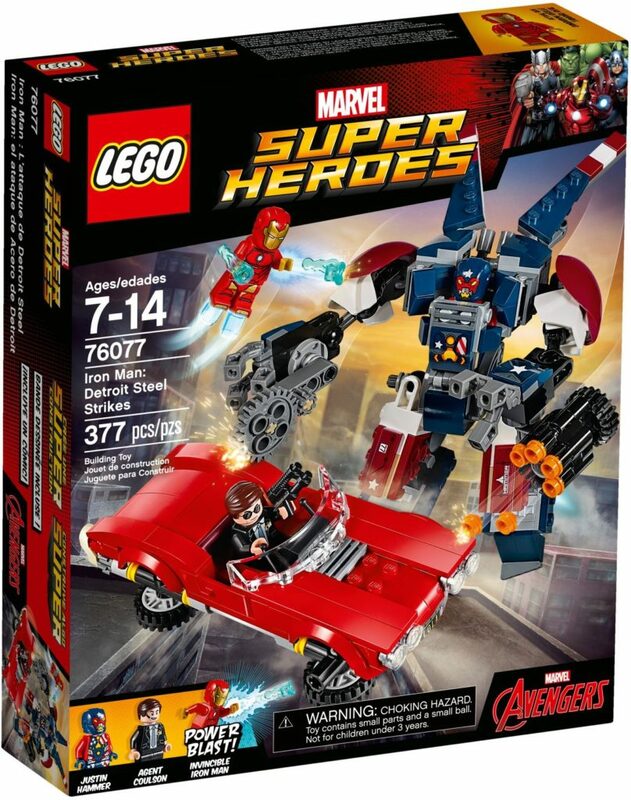 Normally, I’d buy this set because of the mech, as mechs are cool, but this time, it was all about Agent Coulson and his car, Lola. I’m a huge fan of Marvel (as well as DC, but that’s a story for another time), and I’m really excited about the big movie that ties it all together, Infinity War. The fact that we can have multiple movies and TV shows all linked together is really exciting to me, and just shows the amazing talent that these creators have. The box contains three numbered parts bags, two instruction booklets (one each for Lola and Detroit Steel), and a sticker sheet with 10 stickers. A lot of stickers for a relatively small set! Let’s begin with the minifigures. First up, Iron Man. 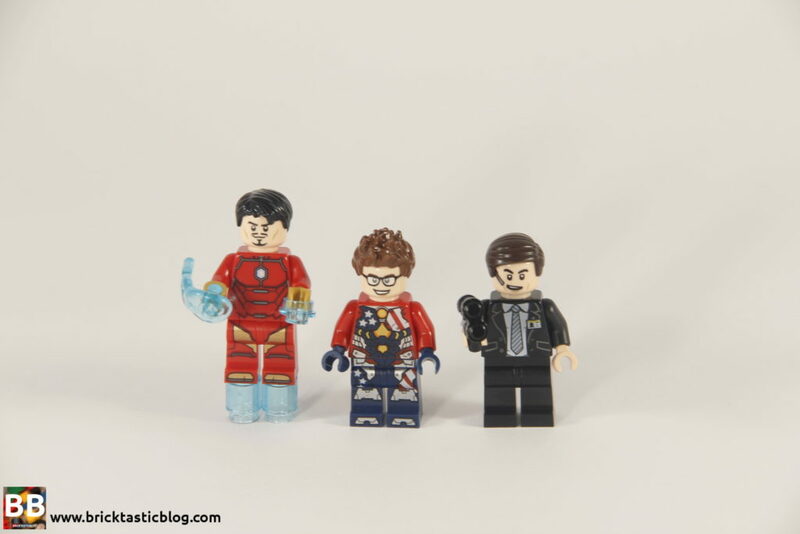 He’s certainly no stranger to LEGO sets, as he has made appearances in almost 20 different sets or polybags, however, this is the first time we’ve seen him as Iron Man in his Model Prime armour. This one’s really cool. It’s smooth, clean, and can change shape depending on what Tony Stark needs it to do, and what I think is the coolest thing – become invisible, so Tony is seen without it on, appearing defenceless, while all the time being totally armoured up. As far as the minifigure goes, I quite like him. To be honest, I prefer the helmet with the flip-up mask, as this one is just one piece he slips on in place of hair, but the printing is good. It’s a shame there’s no arm printing, but it is meant to be a more streamlined suit. It’s understated but definitely Iron Man. He’s got back printing as well, with a double sided head – angry face, and what I call concentration face. His head has been seen many times before. This is also the first time we’ve seen this variant of flick fire blasters, called Power Blast. Push the side of the element and they shoot out of the hand. There’s not a huge amount of force to them, but they don’t usually need to travel very far. 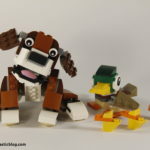 They’re also in a couple of other sets, so keep an eye out for them if you like them. Justin Hammer is Tony Stark’s competitor and rival in the defense contract game, and ends up being one of Tony’s many enemies. He’s been portrayed as both an older and younger guy, with this set most likely showing him as the character played by Sam Rockwell in Iron Man 2. This is a really strange character inclusion. While Hammer Industries later on down the track has some involvement in the Detroit Steel armour, it’s actually Justin’s daughter Justine that designs it, and Justine’s daughter Sasha that pilots it. The link is there, but it’s very tenuous. As far as the armour goes, that’s even weirder. He never wore any armour in the comics, nor does he wear any in Iron Man 2, so I have no idea where this comes from. In any case, the printing is a little crazy. It’s chock full of details and it looks odd. The helmet is the same mould as Iron Man’s, with very odd printing – it looks like he has a bug mouth, and the torso and legs are covered in stars and stripes. It’s like what Captain America would look like if he completely lost his mind and turn to the dark side. There’s printing on the back as well, but I don’t really like it. Not just for the fact that it doesn’t exist in the comics or film! Both Iron Man and Justin Hammer’s armour is unique to this set, but I only like Iron Man’s. Justin Hammer’s double sided head has been seen once before, in 21302 The Big Bang Theory. Lastly, there’s Agent Phil Coulson. 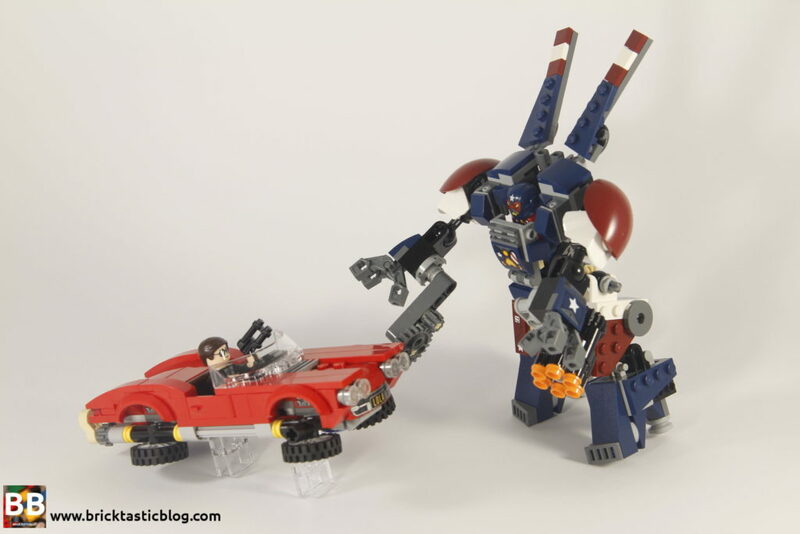 We’ve been waiting for a minifigure version of him for a long time – nine years in fact! He is kitted out in his trademark suit and tie, with little nametag as well. There’s some basic printing on the back, as well as an excellent double sided head. One side has a smirking face with a bluetooth headset, and the other with a no-nonsense look with black aviators. 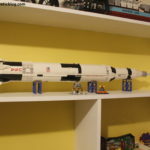 It’s brilliant, and I’m so glad he has been immortalised in LEGO. I’m not the biggest fan of his hair, as it’s not the same as the cinematic universe’s character, but it’ll have to do. Other notable parts include the 1×4 bowed plate with the Lola number plate and air intake printed on, a six-shooter housing, shoulder plates, a selection of red tiles, a very snazzy windshield, ball joints, and cogs. It’s a lot of fun driving Lola around, and then changing the wheels so she (not it) hovers and flies. It’s excellent. 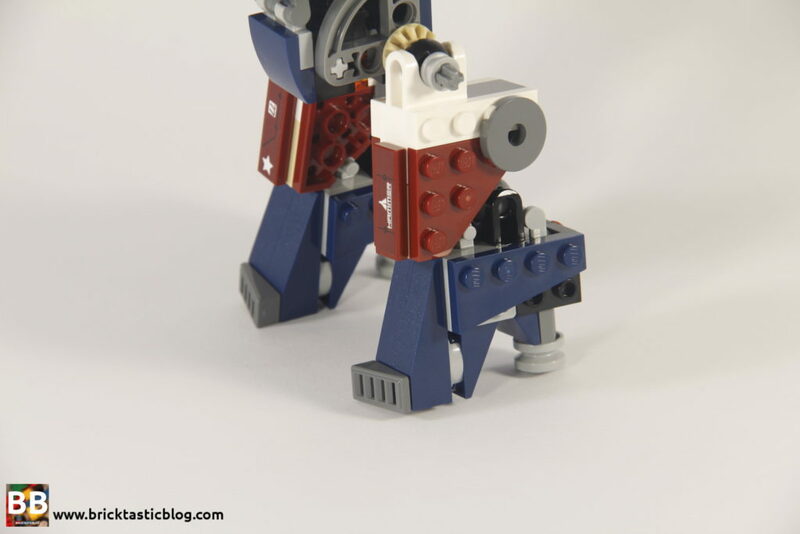 The mech is on the smaller side, but there is a good amount of movement, especially in the legs. The arms, not so much, as the chainsaw (yep, that’s what that is meant to be), and the gatling gun tend to get in the way. The hands are also very small, so it’s difficult to have it hold anything, but it makes up for it with the gatling gun. That’s a lot of fun. 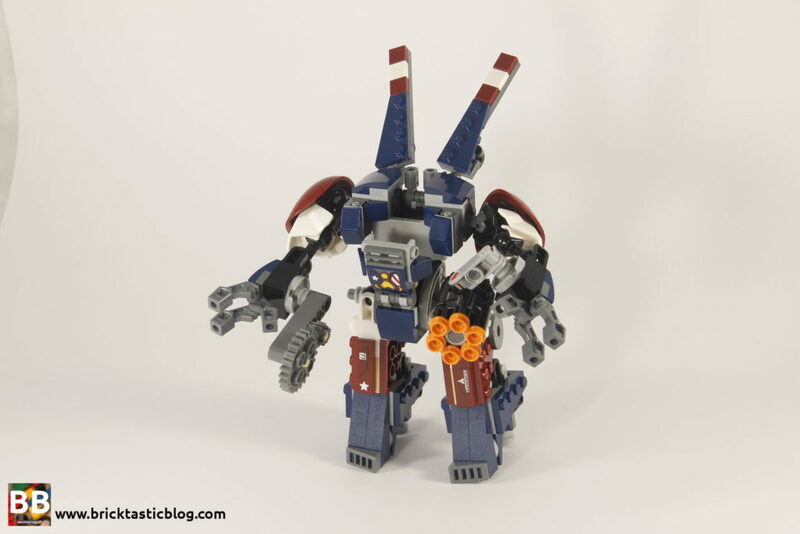 All in all, for a minifigure scale mech, it’s good. Detroit Steel is currently terrorising my Modular street. It all starts with Lola, the Chevrolet Corvette from 1962. 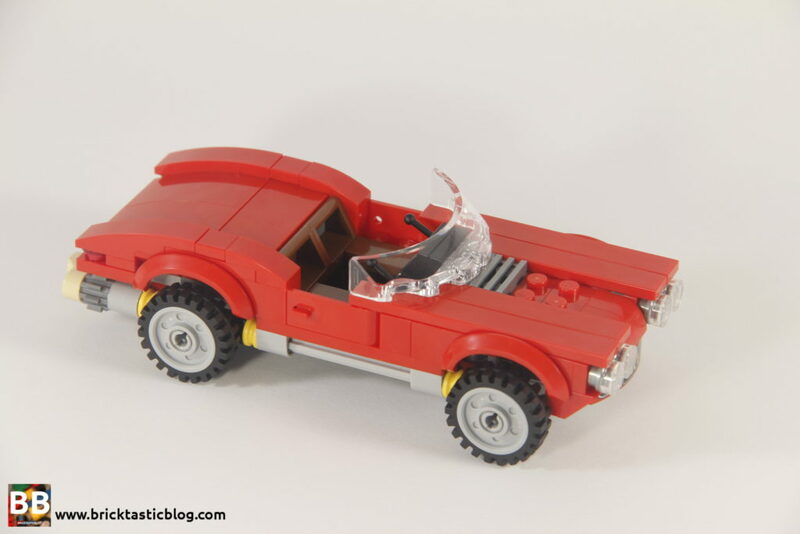 Like every minifigure scale car, it starts with the chassis and works upwards. It’s simple, and very enjoyable. Nothing particularly exciting, but there is a light sprinkling of Technic with the wheel setup. I will say that the stickers that need be applied to the insides of the wheel arches are a pain, even with tweezers! I can’t imagine what they’d be like with just fingers. Once Lola is out of the way, it’s Detroit Steel’s turn. 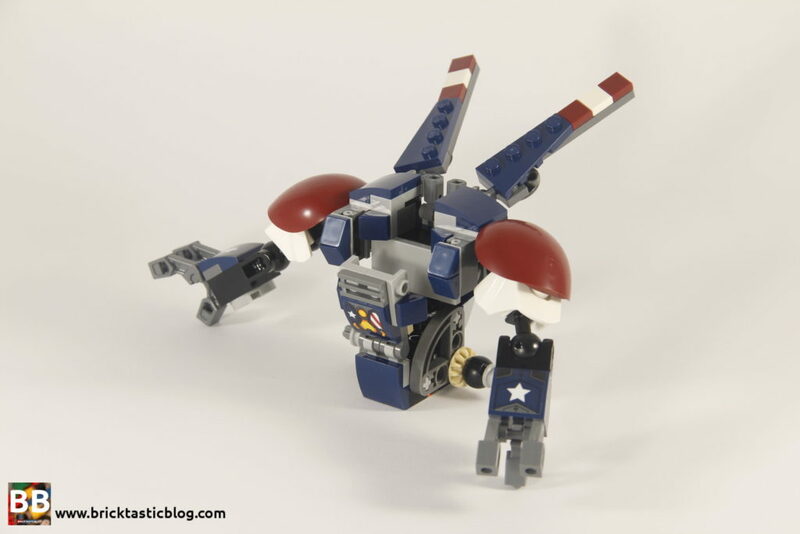 As with every mech, it follows the same order – torso, arms, legs. There’s some simple Technic and SNOT used, and it comes together very quickly. The whole set is solid structurally, and the stickers are quite understated, suiting the mech quite well. I particularly like the Hammer Industries logo on the left leg. It would have been good to have a little more to the forearms, but it would have impacted the movement of the arms as a whole, so it’s a sacrifice worth making. Lola is stunning. 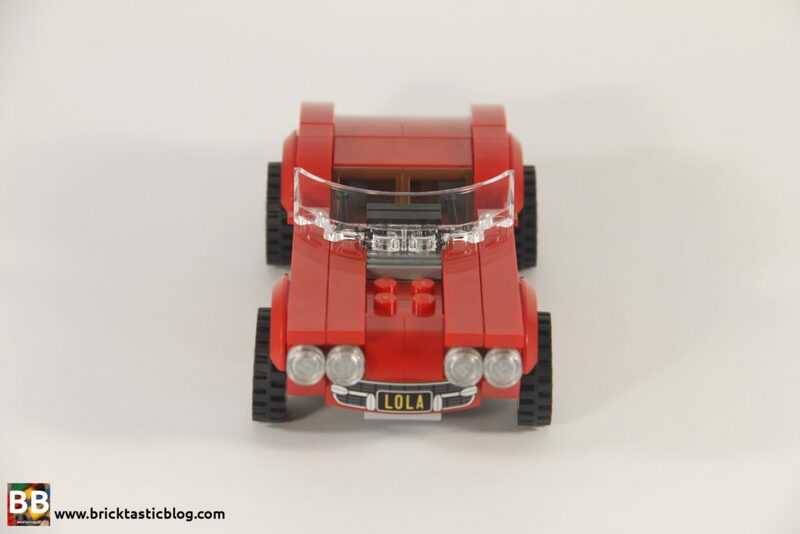 It’s one of the best minifigure scale cars I’ve ever seen. The designers have re-created the shape of the vehicle really well, with the only criticism being that the hood is a little too flat. That’s the only thing though. It looks great in both modes – normal and hovering. 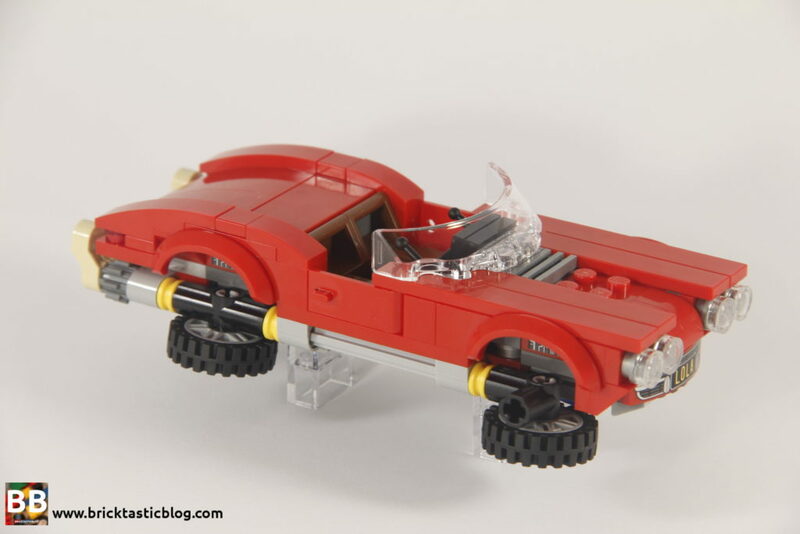 The tail looks a little strange with the Technic elements being visible, but these are just so the wheels can be rotated. It does also mean that the axles are very visible along the side of the car, but it’s worth it for the play value. Detroit Steel looks quite imposing for a smaller mech, however there’s a bit wrong with it. The chainsaw attachment is just wrong. It looks very slap-dash. The gatling gun is much better. One of the strangest parts of the mech are the boots. They look like stillettos! In some versions of Detroit Steel, it certainly does have boots like that, which look just as odd, but they’re not as accentuated as that. It’s too much. The legs are also a little too chunky for my liking. I honestly think the designers could have done more with this mech when it comes to weaponry. Don’t get me wrong – it’s good for what it is, but there’s more potential. Maybe a mod is in order. I’m not the biggest fan of the hips either. They look unfinished. All in all, it’s not bad. It’s not great, but not bad. It’s a good thing that Lola is included. She’s a beauty! For $50, this set is excellent. 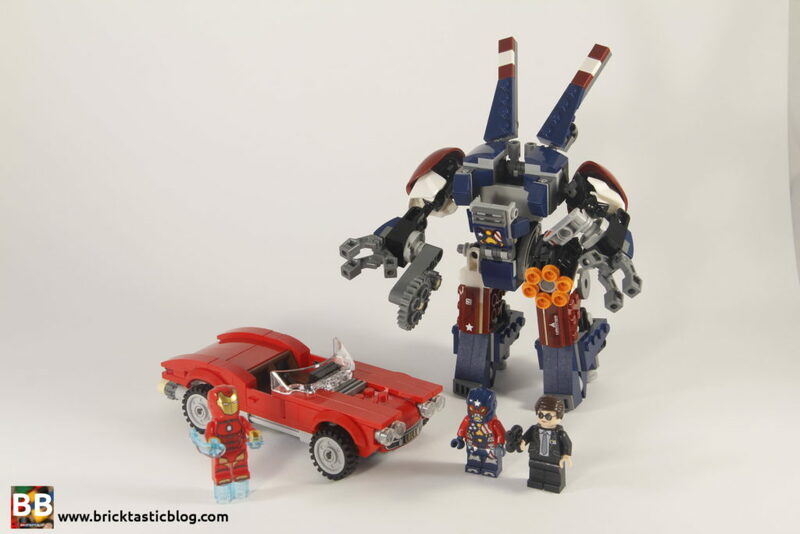 Two brilliant minifigures (and Justin Hammer), and a cracker of a vehicle, and a mech for added fun. Apart from the three exclusive minifigures, the elements are pretty standard, but there is plenty included to get excited about. Lola. So good! 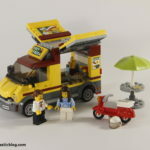 Just for the minifigures and Lola, this set is hugely collectible. 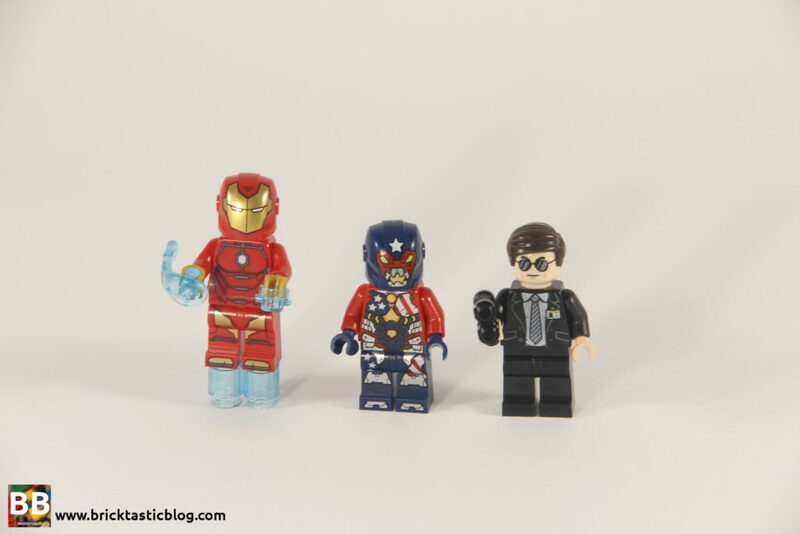 Agent Coulson, Iron Man in new armour, a lesser known bad guy in Justin Hammer, a mech, and possibly the best minifigure scale car you can get in a set that’s affordable? It’s a highly collectible set on my list. As soon as I saw it in the shops, I grabbed it without even looking at the price first! 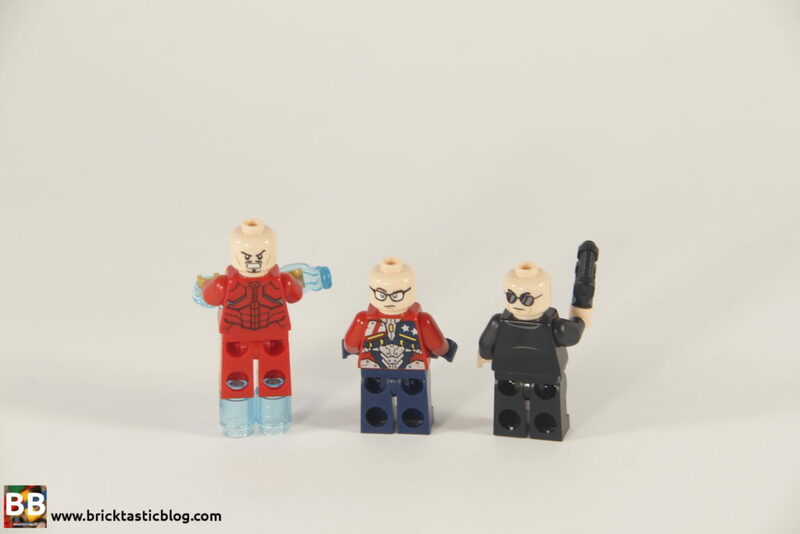 Next week (again, providing nothing happens that means we need to get to the hospital), I’ll be looking at the next four BrickHeadz, from the Marvel line up – Captain America, Iron Man, Black Widow, and The Hulk. Are you a Marvel or a DC fan? Which is your favourite character? Let me know in the comments below.